A Day in the Life of a Sports Fanatic! Visitors love that sports are center stage in Cooperstown. Home to the Baseball Hall of Fame and Museum, sports fans flock to catch a glimpse of baseball legends and relax in the pristine surroundings of Lake Otsego. If that describes you or your traveling partner, here’s how to pack as many sports-centered activities into one day as you can. 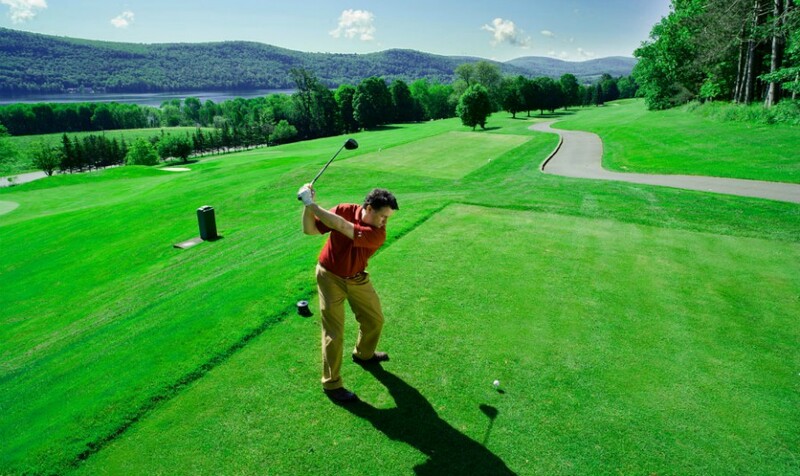 Hit the Greens - Round up your buddies for a short 9 or a full 18-holes of golf at Leatherstocking Golf Course. As one of the most challenging and scenic courses in the Northeast, you’ll feel both relaxed and accomplished come lunch time. Be sure to check their specials page for current discounts or deals. Keep Up Your Energy at Hawkeye Bar & Grill - Celebrate the winner with a draft beer and lunch by the lake at the newly renovated Hawkeye Bar & Grill. Watch boaters while you enjoy conversation (or smack talk) and handcrafted food featuring the best in local ingredients. Our popular Butcher’s Burger and Wood-Fired Pizza are tasty and filling. Hawkeye Bar & Grill is just a short walk from the Golf Pro Shop, so an easy and convenient midday meal after a rousing game of golf. Bring on the Baseball! - Your afternoon is sure to be a homerun when you spend it at the iconic Baseball Hall of Fame and Museum. Exhibits feature baseball heroes, memorabilia, record breaking stories, and discussions around race and sports. Loads of special events are scheduled year-round - check the events page to see what’s happening during your visit. Summer baseball bonus! Are you planning on a visit during Hall of Fame Weekend July 28th - 31st? Our friends over at Cooperstown Getaway put together a great post with tips from the locals on where to park, eat, and maximize the fun! Not Time for Dinner Just Yet? Go back to where it all began. Head over to Doubleday Field to experience Cooperstown's sports roots for yourself. Then, grab a drink at Cooperstown Beverage Exchange before dinner. It's just a short walk from the field. Try their Spitball Cinnamon Whiskey if you dare! Their handcrafted spirits celebrate the best Cooperstown traditions, including why this day is all about sports. Wind Down at Brewery Ommegang - Ommegang is the perfect spot to conclude a fun-filled day. Surrounded by the beauty of central New York, the beer and the food couldn’t be better. Ommegang prides themselves on pairing food and beer, and if you’ve only ever done this with wine - you are missing out. Check their calendar, because during the summer, Ommegang hosts lots of outdoor events and concerts perfect for a countryside sunset. After all that, get a sound night’s sleep so you’re ready to tackle tomorrow’s adventures, whatever they may be. Foodies, art aficionados, and outdoor enthusiasts are just a few of the others you see frequenting Cooperstown. Stay tuned to our blog for more ideal day scenarios later this summer.